At any rate, Nemesis Engine does not so much see a maturation of Sorrowseed's Gothic/black metal as it does a focusing or narrowing in on several of the more brutal and elegant ingredients of the earlier albums. They're still essentially the New England manifestation of all things Cradle of Filth, Dimmu Borgir, Hecate Enthroned, Seibenburgen, Therion and Limbonic Art, only I don't feel like they arrive at that destination via emulation or parody, but rather due to a shared love of Gothic horror, fantasy, piano instrumentation and extreme metal. Lilith Astaroth might sound somewhat like Dani Filth in timbre, thanks to the mesh of snarls and deeper growls she employs, but I also hear a little Satyr in how she constructs some of her syllabic passages. Also, the cleaner melodic vocals she throws on there provide a theatric versatility that seems suited to the subject matter in the lyrics...what if Filth himself could cover S-J Diva's lines himself? It's a great talent to have, and while I wasn't quite sold on Lilith's ravings the last time around, I think her brute grunts have developed rather well, still my preference over the higher pitched screams. 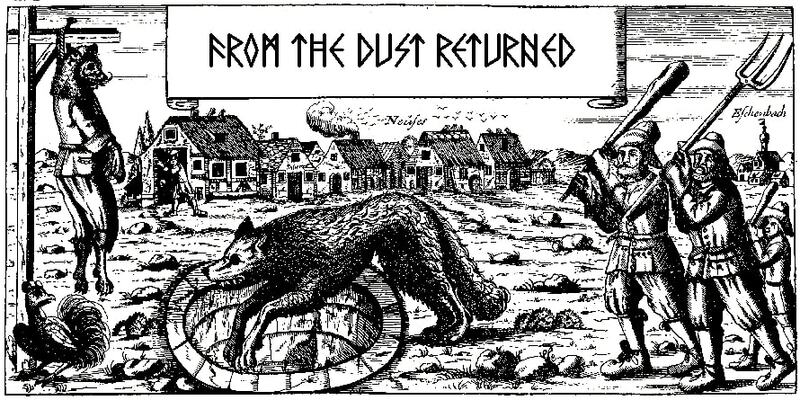 There are even some operatic, ethereal lines tastefully tackled on the title track, and some gang gutturals and rasps on "Scourge of the Hierophant" that support Astaroth's pestilent barking. Musically, I found Nemesis Engine to be a more riff-based entity than its predecessors, with that sweeping sense of orchestration serving more as a backdrop role, reaching its peak in the intro ("Phylactery") and then letting the guitars, drums and vocals breathe over most of the material. Most often you'll just hear a few piano lines used to season a chorus or bridge without stepping all over the guitars, a mistake many bands of this ilk often make. Tunes are generally reined in around an appreciably compact, 4-ish minute duration, and Morte McAdaver's riffing palette this time around seems to surprisingly revolve around a more thrashing impetus. You've got some definite bursts of the tremolo picking and dissonant chord-work relevant to traditional black or melodic death metal, but I also heard a lot of progressions redolent of Gwar's darker, twisted material, a bit of classic Metallica, or even Coroner's Mental Vortex, though I think that last comparison is largely due to the level of saturation in the guitar and spryness of several grooving patterns. There aren't a lot of hooks which instantly cling to the memory, granted, but plenty enough variation which never succumbs to ceaseless repetition or truly dull chord expressions. Where Nemesis Engine does excel is in the lead department. Not only Morte's own playing, but also in the decision to bring a number of guests on board, like Chris Adamcek (who helped out on the earlier albums) and New England shredder Eric Pellegrini...but the name that will turn a lot of heads is Andy LaRocque, who adds a flighty lead lick to "Sepulcher Legionnaires". I only got to shake the man's hand when opening up for Death in the early 90s, but to actually have him throw down on your album? Color me jealous, though my favorite here might have to be Adamcek's gleefully diabolic solo in "Artillery Ghost". The new drummer Prometheus B. Subrick also shines, with a dynamic and technical performance akin to what you might hear on a Polish death metal outing in the 21st century: clean kick and snare tones, lots of pinpoint precision double bass. It does seem at times he might be holding back a little, but only because the nature of these songs doesn't often lend itself to fits of gravity-blasting extremity...they exist here, but generally the mid paced beats better serve the riff style and give Lilith's vocals a better chance to impress. The one sonic component I wish was better pronounced here was the bass. The swerving lines are certainly audible, the playing competent, I just wish they were a fraction fatter in the mix to balance out the guitars and vocals. 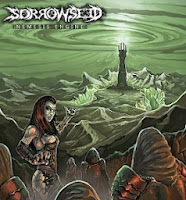 Sorrowseed continues to have the conceptual creativity on lockdown, with some of the more intriguing song titles I've heard this year ("Artillery Ghosts", "Necropolis March", "Stygian Athenaeum") and quality lyrics to support all of them. Let's be frank: if you dream of the day the Scourge will rise up and claim Azeroth for its own, or you find yourself siding AGAINST Ash when you watch Army of Darkness, even if you just like squatting in the Eastern Plaguelands, or tabletop role playing as a death knight or necromancer, this is an album for you. Loads of Anglo-poetic padding to the lyrical imagery, not unlike how Dani Filth puts together his material, only a bit less gaudy and complicated, make songs like "Corpse Colossus" fun to read, and much like The Extinction Prophecies, there's just a lot of effort involved throughout and I can't help but enjoy it. As a whole, I was probably more impressed with the double album than this, but Nemesis Engine is superior to either of those discs individually. The riffs could be a little catchier, and a further fusion of eerie atmospherics to the raw metal mechanics could prove more effective with the subject material, but there is no question that the vocals feels more cohesive, the leads better written, and the execution better grounded. If you're not the sort to shy away from the Gothic/black metal architecture of the later 90s, whether by its more popular practitioners or those less celebrated, then check this out.